Cataracts are a medical condition in which the lenses of the eyes become clouded. The condition more commonly affects older Americans, but it is possible to see babies develop this condition as well. When left untreated, you usually have no treatment option but to undergo a surgery. Let's find out more about how common cataracts occur in babies and what treatment options are available. Are Cataracts Common in Babies? Cataracts are usually associated with elderly people, but some babies may also have this condition. While the condition is quite uncommon, it is certainly not rare. Statistics show that every three infants (under one year of age) out of 10,000 are diagnosed with this condition. The percentage is quite high though for children between one and ten years of age. Cataracts in babies develop due to abnormal lens development and it happens before the birth; however, the symptoms usually develop during childhood. The condition usually develop quickly in children and it takes children longer to receive their vision. It is therefore important to learn a bit about the symptoms of baby cataracts to seek appropriate treatment. Genetic abnormalities are usually the main cause of infant cataracts. Sometimes, metabolic disorders may also cause the issue. You have to understand that all babies have poor vision at birth, but they slowly learn to see images after they are sent to the retina. Sometimes, the retina does not receive images, which in turn makes it difficult for the optic nerve to send image signals to the brain. Eventually, the nerve degenerates and leads to serious vision impairment. It is important to point out that in many cases, common infections, drug reactions, and inflammation can also cause congenital cataracts in babies. This can happen when you develop rubella, measles, or other infections during pregnancy. 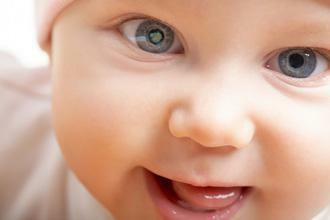 When your baby has cataracts, there may or may not be any visible symptoms. The severity of the symptoms usually depends on how cloudy the lens becomes over time. The location of the cloudiness also has a role to play. Sometimes, only one lens is affected but sometimes both lenses may be affected. The symptoms may be severe when both eyes are affected. Your child may have difficulty recognizing objects mainly because of poor vision. You may notice your child have rapid, uncontrolled eye movements. You may notice that your child's eyes are pointing in different directions. Once you know your baby or child has cataracts, it is important to seek immediate medical attention. The doctor will consider different symptoms to know the severity of the problem. Depending on the degree of cloudiness, your child may or may not need cataract surgery. In most cases, your doctor may not recommend surgery, especially when cataracts are asymptomatic. Your child needs to be under close supervision though to monitor any vision changes. Surgery is usually required when cataracts are affecting your child's vision. It involves removing the affected lens. Your child will then have to use contact lenses or glasses. The surgery is performed under general anesthetics and takes about 1-2 hours. It is important to perform a surgery as soon as possible if your baby has vision problems from birth. After the surgery, you will have to use eye-drops to help reduce inflammation, which is common after the operation. Your child will have to wear glasses because their eyes will be blurred. You will have to keep in touch with your doctor because they will monitor your child's vision, which is likely to develop with age. It is worth pointing out that sometimes doctors recommend occlusion therapy when they find cataracts in babies. This is usually the case when only one eye is affected. The therapy involves wearing a temporary patch over the healthy eye. The main purpose of this patch is to make the weaker eye learn to focus more and help the brain to recognize visual signals. It is usually quite difficult to make a child wear a patch, so you may have to talk about other treatment options as well.